That was an interesting (and busy) evening. Just before our 5pm broadcast storms popped up over the southwest side of the metro area and then gradually worked their way to the southwest and into Yamhill county. A few other isolated showers developed near Aurora and in Clackamas county, but that was it. The vast majority of us didn’t have rain today…too bad for my garden. I see a MADIS station had .70″ in Sherwood, another near Yamhill had .80″ and still another near Yamhill received 1.79″! Wow, that’s a huge soaker like what we saw last June in the West Slope area. 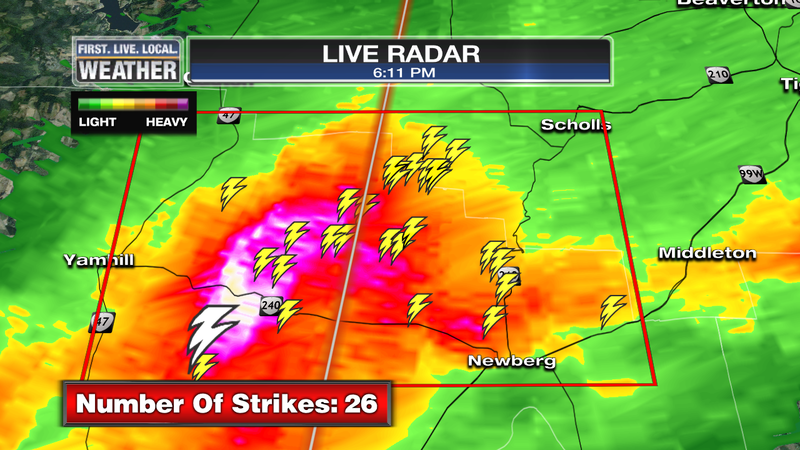 About 10,000 PGE customers lost power and a couple of spots likely saw .50″ hail…near King City and east of Yamhill. That’s according to radar. The storms didn’t produce much lightning until they pushed southwest and then suddenly spit out 50-80 strikes in just 1/2 hour! It’s all quiet at 11pm with just a few showers moving west across the east side of the Willamette Valley. The main action shifts east of the mountains tomorrow with the west side under a solid marine layer. The upper-level flow will still be light easterly. It IS possible to get thunderstorms over the top of the marine inversion (I’ve seen that happen), but not likely. This entry was posted on Monday, May 18th, 2015 at 11:06 pm and is filed under Weather. You can follow any responses to this entry through the RSS 2.0 feed. Both comments and pings are currently closed. Last evening’s thunderstorms, as seen from Oregon City, looking SE. ~4 hours compressed to just over one minute. At one point, you can perhaps see some mesocyclonic rotation beginning to develop? First, the birth of the storms from Milwaukie. Next, looking SW from OC. Then, looking SE from OC. Not a single drop in The Dome. Heard some thunder to the West around 5-ish, but it all moved (incredibly slowly) away from us. It hit all around us in virtually every direction, but nothing built up or moved in to replace it. That little storm front I was watching yesterday got shoved due West and dissipated before reaching PDX. No surprise there. When you say it’ll happen, it doesn’t happen, when you don’t say nothing, it does happen. Two years ago I had a truly epic day where thunderstorm after thunderstorm swept through. I literally lost count how many there were that day. I think it was four or five total, most likely. And they were all good-sized storms with lots of thunder and lightning, and at least two had hail. Since then, I think I’ve had maybe one wimpy one-or-two-claps-then-its-done “storm”. That’s it. Feast or famine. I wonder how many more years I will be paying for that one epic day. It was September 2013. Just found my old comment. And it was four storms. Some of them were in fact small and wimpy. I’m already starting to magnify the event in my mind. It was also a day that the marine stratus layer did not dissipate. All the storms happened with me under the marine layer. I believe that’s the only time I’ve experienced that. Thick clouds and drizzle here in Battle Ground. Looks like the mtns got a good soaking. Oh good ole Fields Oregon. .53 inches just west of Carlton.